Anzac cookies baking creates one of those smells that instantly takes me back to my childhood and my mama in the kitchen. We are not a big cookie family, much to my kids disappointment BUT Anzac cookies, especially on Anzac Day, are ones that we do bake up on a more regular basis. 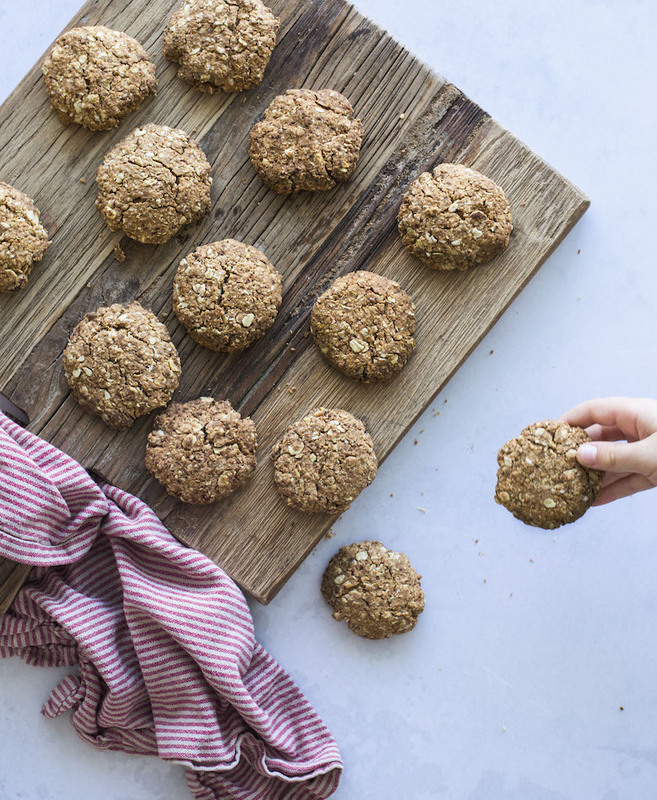 Now I loved those REALLY sweet, crunchy – or gooey – ones that my mum made, but they were so full of golden syrup, butter and sugar that I wanted to make a healthier version for my kids to still enjoy. This is what we came up with. I think they still hit the spot. Mix all the ingredient in a large bowl until well combined. Roll tablespoonfuls of mixture into balls and place on baking tray lined with non-stick baking paper, pressing down on the tops to flatten slightly. Cook in the oven for 25-30 minutes or until browned.